Sharkfin Shoal Light was constructed as a cottage screwpile lighthouse in 1892 with a fourth order Fresnel lens. It was located two miles southwest of Clay Island at the Nanticoke River. 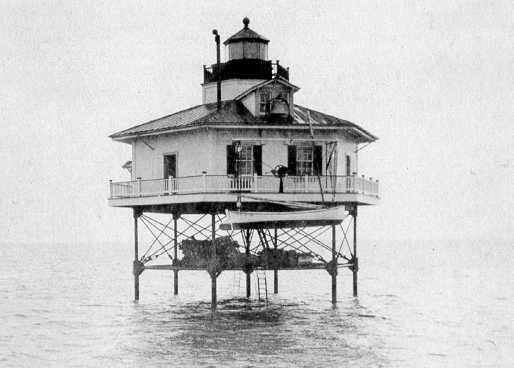 This lighthouse replaced the Clay Island Light that was located two miles to the northeast. The lighthouse was demolished in 1964 and a skeletal tower was constructed on the original screwpile foundation. Tower is accessible only by boat. 2001(c) Chesapeake Chapter, USLHS. All rights reserved.